I admit freely that I am a big fan of Michael David Winery. As a matter of fact, I have liked every single Michael David wine I have tried, which is a rarity for me. Named after winemaking brothers Michael and David Phillips, the winery truly put Lodi on the national wine map with the success of its 7 Deadly Zins, one of my favorite Zinfandels, and the top seller in the United States right now. But Michael David Winery is also famous for Freakshow Cabernet, Petite Petit (which I have reviewed previously), many award-winning reserve and limited edition wines, and now a delicious red blend, also called Freakshow. Freakshow Red is a rich blend of Lodi Syrah and Petite Sirah, and it’s a treat. There’s a nutty blackberry aroma when you open it, and the characteristic velvety mouth-feel I have come to expect from Michael David wines. I tasted really bold blackberry and plum, with coffee and dark chocolate on the finish. This is a smooth, delicious wine that is available for around $15 just about everywhere. 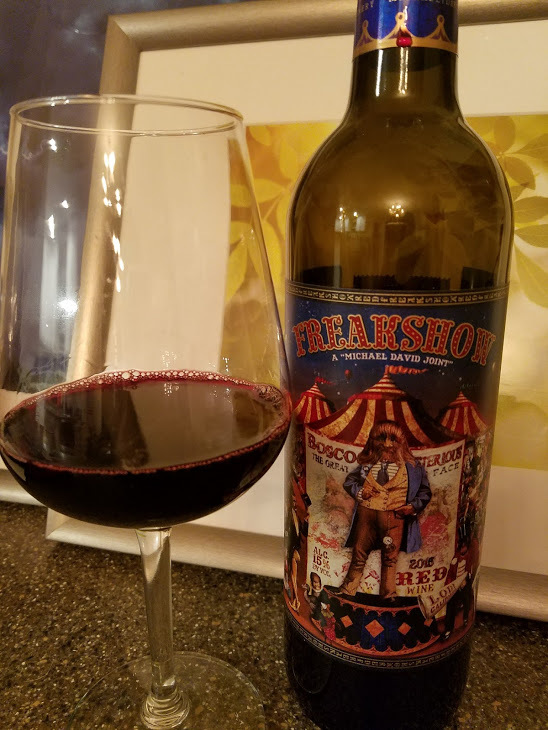 On my five-cork scale based on taste and value, I give the 2015 Freakshow Red Blend 4 corks! It’s another crowd-pleaser from Michael David Winery.